The mayor announces his plan, which he foreshadowed two weeks ago in his state of the city address. As they confronted an unprecedented homelessness crisis, first the Bloomberg administration and then their de Blasio-era counterparts turned to private apartments and hotels in a search for beds that the city’s traditional shelters could not provide. It was costly, problematic and, authorities hoped, temporary. But the fierce demand for shelter does not appear to be fading. So on Tuesday, Mayor de Blasio announced a plan to replace those sites with 90 new shelters and the expansion of 30 existing shelters. The new shelters would be opened over the next five years, beginning with 20 in 2017 and 20 in 2018. The reliance on cluster sites, where the city rents private apartments for use by homeless families, would persist until 2021 under de Blasio’s plan. Private hotel rooms could be in the mix as late as 2023. The plan commits the administration to the goal of reducing the shelter population by 2,500 over the next five years. As of Monday, there were 59,997 people in New York City shelters. Tuesday’s announcement represents the latest effort by the de Blasio administration to get on top of the homelessness problem. Coming into office on the heels of a searing New York Times series about one child’s life in the city’s shelter system, the mayor in 2014 pledged action—specifically, a replacement for the Advantage program, a temporary housing program for moving people out of shelters that the city and state killed in 2011. It took several months, however, for de Blasio’s new voucher initiative, Living in Communities or LINC, to get off the ground. Part of the problem: Landlords burned by their experience with Advantage were reluctant to sign on to another homeless-housing program. Eventually, the LINC effort gained some traction. In 2015, however, tabloid coverage of an apparent surge in visible street homelessness put the administration on the defensive. The sudden departure of the deputy mayor overseeing homeless policy, criticism over poor living conditions in shelters and the resignation of the commissioner of homeless services all led up to the mayor ordering a 90-day review of his homeless policies. In the midst of that review, a man was killed by his roommate at a homeless shelter a woman and her two children were murdered at a Staten Island hotel where they’d been placed by the city’s shelter system. The results of the 90-day review, released in April of last year, led to 46 policy changes—chief among them the move to house the Department of Homeless Services within the Human Resources Administration, consolidating the agencies that run shelters and administer public benefits. Later in 2016, protests erupted in neighborhoods like Elmhurst and Maspeth where the de Blasio had placed homeless people or announced plans to. Two children were killed in a radiator accident at a cluster-site building in the Bronx in December. De Blasio’s programs did see success: LINC and other initiatives succeeded at moving more than 50,000 people into permanent housing, there were signs of progress against veterans’ homelessness and street homelessness, and the city reported promising numbers from its effort to prevent evictions by providing more lawyers for tenants in housing court. The problem was the number of people arriving at shelters continued to soar. There were about 800 more families with children in the system in January 2017 compared with the previous January. 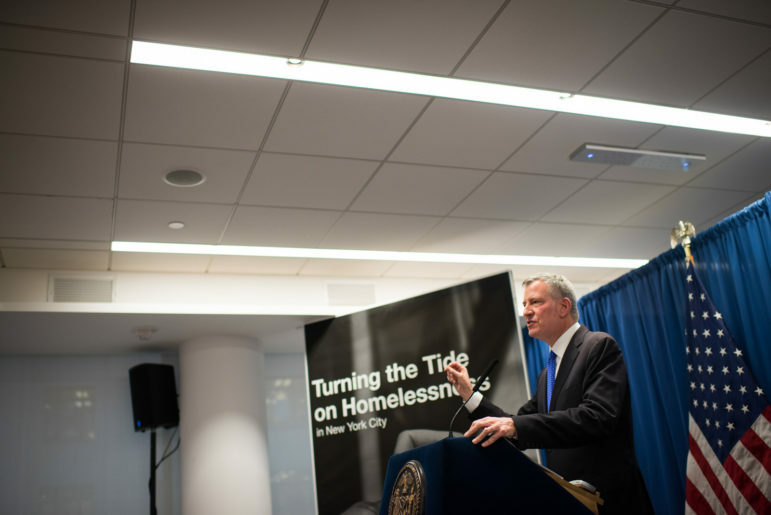 The De Blasio plan released Tuesday notes that over the last 20 years, the number of homeless in the city had risen 115 percent – a trend the city blamed on the failure of wages to keep up with rising rents. After months of pressure by advocates, the administration recently announced that a larger share of the affordable apartments created or preserved under the mayor’s 10-year Housing New York plan would go to families with low incomes. The new strategy, called “Turning the Tide on Homelessness,” pledges the administration to continue its efforts to create more affordable housing, prevent evictions and make the shelter system run smoother. Its heart is the plan to build new shelters, close the cluster and hotel sites and try to keep homeless people closer to their neighborhoods. With 270 buildings containing 3,000 apartments used to shelter 10,000 people via the cluster program and 80 hotels housing an additional 7,500 people, nearly a third of the shelter system doesn’t live in shelters. Eliminating those sites will consolidate the system to about half as many sites, the plan says, although it will take five to seven years to do it. In the new shelters, “There will be career counselors, mental health and substance use disorder counselors and other services on site,” the report says. There’s lots of empty buildings and vacant lots in DeBlasio’s Sunset Park neighborhood which would be most suitable to house at least 5,000 of the city’s homeless. With good public transportation plus within walking distance of Industry City, many could find jobs quickly, get back on the feet and go for the next step in regaining their independence. There’s plenty of empty space in Sunset Park that the city can build subsidized affordable housing, not housing projects. for those who were in shelters but became employable. The progressive DeBlasio then can say that he is not a hypocrite but placing these unfortunate people in the same area of his two brownstones. A part of the problem is that too many people in the system come from outside of NYC. There are many documented cases where people come to NYC because they know that they will be provided with free housing. It clogs the system and makes what should be a strictly local problem much larger in scope. Shelters are not a solution to homelessness: housing is. People in shelters are still labelled homeless, and as such are viewed as a transient, contributing to community rejection of shelters. I wonder if the “shelter” response isn’t a warped form of job security for DHS personnel? Bill de Blasio has added significantly to New York’s decades-old effort to protect the undocumented. But when it comes to fully resisting Trump’s aggro enforcement policy, the city’s political will and legal authority are limited. The mayor has rejected criticism and coverage of his preliminary budget as “disingenuous” and “inaccurate.” When Mike Bloomberg was mayor, Councilman Bill de Blasio often found fault in the budget outline.